Of course, there isn't nothing much we (CSK Fans) can do when Sanath is in such supreme form and Dhoni does some pathetic captaincy by not even changing the bowling during the power play, while Jayasurya kept sending Morkel & Gony to all parts of the ground! I just noticed this blog and this is my first post. Losing is one thing but losing with 7 overs to spare is another. Much as we are fans of CSK (for obvious reasons), we have to acknowledge that we have the weakest team in the league (ya - once you remove Hayden and Hussey). We dont have a bowling attack outside murali and balaji. I do not know why Ntini was bid at all we could have gone for one strong killer. Flemming is more an ICL player (one who has completed his career) and is still in test mode. We do not require people who can occassionally fire. We need people who occassioally fail. 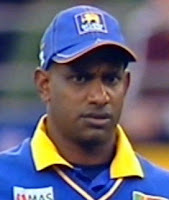 Even if Sanath had not hit like this, we surely were not winnable. Net run rate speaks for itself. We are third from bottom on that - despite being third from top on points! And of course, Mumbai will win in any case:: after all IPL cannot have semis and finals in Mumbai without the home team. I cant belive that happening...do u?